When God sent His son as redeemer, He was writing our adoption story. He knew what it was to long and to wait. He sent His beloved Son to redeem us so we could be adopted into His kingdom as children and heirs. Galatians 4:4-5 says that God waited for the “fullness of time.” Not only had the right time come, but the circumstances were right too. There had never been a more perfect time and there would never be a more perfect time. And that’s exactly how God’s timing works. Perfectly. 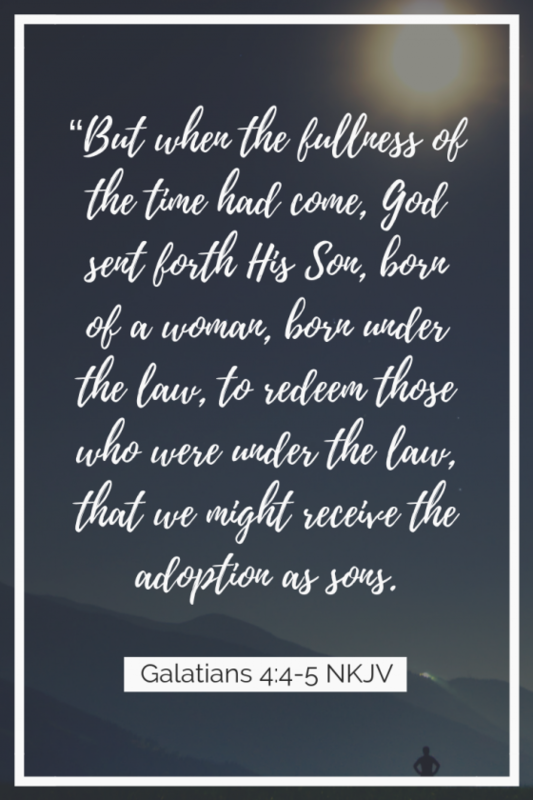 God waited for His adopted children too. To the mama in waiting: I know this Christmas may feel empty without the one gift you want more than anything in the world. I want to encourage you to remain hopeful. God is waiting for exactly the right moment to bring you exactly the right child. The circumstances are still coming together. Maybe He is completing a work in you, or maybe there are other circumstances unfolding that you will never see, or that you may only know in hindsight. Either way, my prayer for you, dear Mama, is that you will have peace this Christmas in the wait. The time is coming. Your child’s adoption story is unfolding even now as you wait. Know that God is walking this journey with you. Trust Him with your heart. And a Merry Christmas to you and your dear ones!